With nearly 38 years experience under my belt, one would think I wasn't capable of a flop such as this! 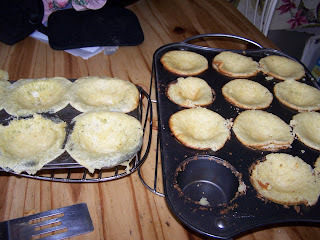 I won't even tell you where I got the recipe for lemon cupcakes (somewhere on the www), as I don't want to humiliate the creator of said recipe. Not that the flop was their fault. they mean fill the cupcake cups 1/3 full. 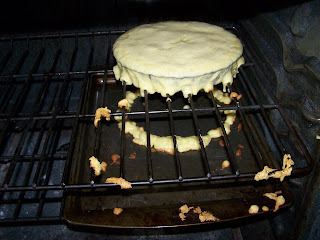 And WHY didn't I pay attention to the ginormous amounts of batter this recipe made? So now I have 18 flopped cupcakes and one flopped round cake. Guess I'll rustle up some lemon frosting and cover the whole mess up!!! My only hope is that my kids or Farmboy will have mercy on me and clean out my oven for Mother's Day! Hope YOURS was at least as much fun as mine has been! Hi! Happy Mother's Day to you! I discovered how to make trifle because of a chocolate cake disaster! Chunks of cake + Cool Whip or whipped cream + fruit! DONE :) phew! You're funny Cyn! But I am just like you...in that, if something is going to go wrong in the kitchen, it's on a special day or a holiday! Hehehe! Oh wow... Nice to know I am not alone doing this type of thing!!! Hope you had a great Mom's Day!!! Anyway!!! I have SO done that cake thing! When we first moved here 7 years from sea level in Calif. to 5,500 ft here in Utah I was forever having cake, muffin and cupcake disasters. I have learned that males in the family don't care how messy or flopped cake looks..it is still cake and they will still be happy to eat it. I hope it goes that way at your place too! It happens to all of us once in awhile. I bet the lemon frosting will make everything much better and tasty too. Oh, now THAT is sure funny. :-D Glad you took a picture to share with the world.